Richardson died on 18 March 2009 from an epidural hematoma after hitting her head in a skiing accident in Quebec, Canada. On 16 March 2009, Richardson sustained a head injury when she fell while taking a beginner skiing lesson at the Mont Tremblant Resort, about 80 miles (130 km) from Montreal, Quebec. At first, she did not seek medical help but complained about a severe headache two hours later. She was flown to Lenox Hill Hospital in New York City, where she died two days later from an epidural hematoma. On 19 March 2009, theatre lights were dimmed on Broadway in Manhattan and in London's West End as a mark of respect for Richardson. The following day, a private wake was held at the American Irish Historical Society in Manhattan. On 22 March 2009, a private funeral was held at St. Peter's Episcopal Church near Millbrook, New York, close to the family's upstate home. Richardson was buried near her maternal grandmother Rachel Kempson in the churchyard. Richardson's aunt, Lynn Redgrave, was buried in the same churchyard on 8 May 2010, near Richardson and Kempson. ^ "Quick treatment could have saved Richardson". MSNBC. 19 March 2009. Archived from the original on 20 March 2009. ^ a b c d e "Natasha Richardson part of legendary acting family". CNN. 18 March 2009. Archived from the original on 21 March 2009. Retrieved 18 March 2009. ^ "Natasha Richardson Leaves Bulk of Assets to Husband Liam Neeson". Fox News Channel. 31 May 2009. Archived from the original on 26 September 2010. ^ Arnold, Laurence; Peter S. Green (19 March 2009). "Natasha Richardson, Actress of Elegance, Pedigree, Dead at 45". Bloomberg. Archived from the original on 19 October 2008. Retrieved 19 March 2009. ^ a b Pulleine, Tim (19 March 2009). "Natasha Richardson The daughter of actor Vanessa Redgrave and director Tony Richardson was destined for the theatrical profession". The Guardian. London. Archived from the original on 6 September 2013. Retrieved 19 March 2009. ^ Singh, Anita (19 March 2009). "Natasha Richardson skiing accident in Canada: profile of actress". The Daily Telegraph. London. Archived from the original on 22 March 2009. Retrieved 19 March 2009. ^ Weber, Bruce (18 March 2009). 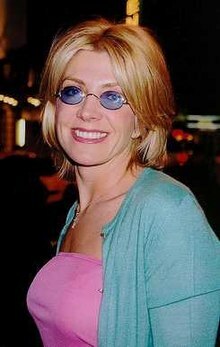 "Natasha Richardson, actress, Dies at 45". The New York Times. Archived from the original on 1 April 2009. Retrieved 19 March 2009. ^ "Aesthetica Magazine – James Scott: Every Picture Tells A Story, London". Aesthetica. Archived from the original on 8 December 2015. Retrieved 2015-12-02. ^ Greenstreet, Rosanna (18 June 2011). "Q&A: Bob Hoskins". The Guardian. Archived from the original on 10 November 2013. Retrieved 18 June 2011. ^ a b "Director: Natasha Richardson "Powerful and Harrowing" in Final Film". Us Weekly. 19 March 2009. Archived from the original on 22 March 2009. Retrieved 22 March 2009. ^ "Obituaries – Natasha Richardson". The Daily Telegraph. 19 March 2009. Archived from the original on 15 June 2012. Retrieved 4 June 2012. ^ "Natasha Richardson: Member of celebrated acting family who found success on stage and screen – Obituaries, News". The Independent. London. 20 March 2009. Archived from the original on 23 March 2009. Retrieved 18 November 2009. ^ Middlekauff, Tracey (2009). "Fighting AIDS in Memory of Her Father". People. Archived from the original on 7 May 2009. Retrieved 21 March 2009. ^ "amfAR :: Natasha Richardson :: The Foundation for AIDS Research :: HIV / AIDS Research". amfar.org. Retrieved 17 August 2015. ^ Bearn, Emily (27 April 2003). "Prime Time for Natasha". The Daily Telegraph. London. Archived from the original on 31 March 2009. Retrieved 19 February 2009. ^ Chui, Alexis (24 March 2009). "Natasha Richardson: 'She Was So Much Fun'". People. Archived from the original on 3 June 2009. ^ Franck, Elisabeth (8 April 2001). "Cigarette Aficionados Go to War". The New York Observer. Archived from the original on 28 September 2008. Retrieved 19 March 2009. ^ "Neeson opens up on death of wife: 'It still kind of isn't real'". ^ "Grave of Natasha Richardson at St. Peter's Episcopal Cemetery in Lithgow". ^ Weber, Bruce (19 March 2009). "Natasha Richardson, actress, Dies at 45". The New York Times. Archived from the original on 31 March 2011. Retrieved 28 February 2011. ^ "Richardson gets West End tribute". BBC News. 20 March 2009. Archived from the original on 23 March 2009. Retrieved 23 March 2009. ^ "Natasha Richardson buried in New York". 23 March 2009. Archived from the original on 19 January 2012. Retrieved 24 March 2009. ^ "Family bid farewell to Richardson". BBC News. 22 March 2009. Archived from the original on 25 March 2009. Retrieved 23 March 2009. ^ "Natasha Richardson Buried Near Upstate NY Home". The Canadian Press. 23 March 2009. Archived from the original on 13 April 2016. Retrieved 23 March 2009. ^ a b c d e Weber, Bruce (2009-03-18). "Natasha Richardson, 45, Stage and Film Star, Dies". The New York Times. ISSN 0362-4331. Archived from the original on 12 April 2016. Retrieved 2017-05-07. ^ a b c d "Natasha Richardson: Obituary". Telegraph.co.uk. Archived from the original on 11 December 2011. Retrieved 2017-05-07. ^ a b c d e f g h i j k l m n o "Natasha Richardson dies at 45". Los Angeles Times. 2009-03-19. ISSN 0458-3035. Archived from the original on 1 May 2017. Retrieved 2017-05-07. ^ "The Comfort of Strangers". Rolling Stone. Archived from the original on 27 August 2016. Retrieved 2017-05-07. ^ "The Favour, the Watch and the Very Big Fish". Find and Watch. Retrieved 2017-05-07. ^ "Past Midnight | e.tv". ekasiplus.etv.co.za. Retrieved 2017-05-07. ^ Scott, A. O. (2001-03-07). "FILM REVIEW; The Full Gel, Curlers and Cream Rinse - NYTimes.com". The New York Times. Retrieved 2017-05-07. ^ "request | Filmmaker Magazine". Filmmaker Magazine. Retrieved 2017-05-07. ^ "Movie review: It may be hard to stay awake in Waking Up in Reno'". DeseretNews.com. 2002-11-15. Retrieved 2017-05-07. ^ a b c d e "Natasha Richardson: Member of celebrated acting family who found". The Independent. 2009-03-20. Archived from the original on 4 March 2016. Retrieved 2017-05-07. ^ "HBO CLASSIC: TALES FROM THE CRYPT S7". HBO Watch. 2012-11-04. Retrieved 2017-05-07. ^ "Natasha Richardson Cast in NBC's 'Mastersons of Manhattan' Pilot | Playbill". Playbill. 2007-01-24. Retrieved 2017-05-07. ^ "Natasha Richardson Dies After Ski Accident". Archived from the original on 3 July 2016. Retrieved 2017-05-07. ^ Wolf, Matt (2003-06-01). "Review: 'The Lady From the Sea'". Variety. Archived from the original on 30 June 2016. Retrieved 2017-05-07.